Northwest Missouri State University is beginning its 2018-19 academic year this week with record retention and a student headcount that is up about 5 percent from last fall and includes one of its largest-ever freshman classes. Northwest entered its first day of classes Monday with a total headcount of 6,786 students while 78.66 percent of its 2017 freshman class returned to the University for a second year, which breaks the University’s 2007 record of 73.51 percent. Northwest’s freshman headcount is 1,351, an 11 percent increase from last fall. 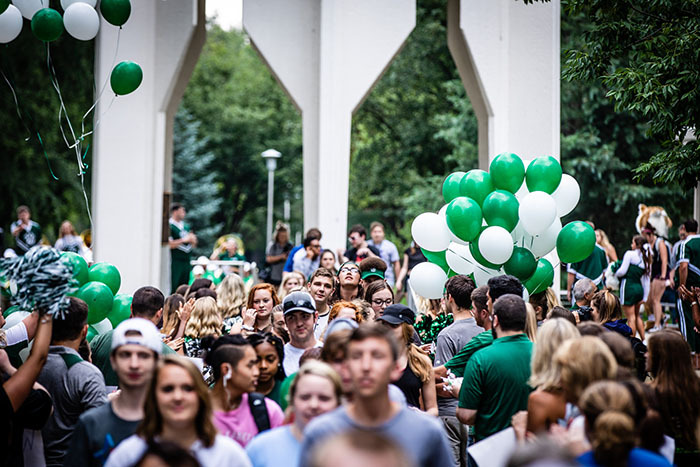 While all enrollment numbers are preliminary until the University’s official census occurs Monday, Sept. 24, Northwest attributes the growth to a refined strategic approach that includes the establishment of a cross-disciplinary recruiting team, enhanced communication with prospective students, and partnerships with marketing and online education vendors to provide services and support aimed at increasing enrollment. Other projected enrollment increases by the University include online enrollment (up 129 percent), transfer students (up 22 percent) and first-time graduate students (up 19 percent). Additionally, Northwest is reporting an enrollment of 224 underrepresented domestic first-time students, the second-largest total in the University’s history and a 17 percent increase from last fall. Northwest’s freshman class includes 67 percent of students from within the state, while 13 percent come from Nebraska and 12 percent are from Iowa; the class represents 21 states and 11 countries. Nearly 17 percent of the freshman class comprises underrepresented populations, of which almost 2 percent are international students. Northwest’s first-time freshman also are academically strong, entering this fall with an average ACT score of 22, which exceeds state and national averages, and an average high school grade-point average of 3.43. Founded in 1905, Northwest – a coeducational, primarily residential four-year university – offers a broad range of undergraduate and selected graduate programs on its Maryville campus as well as its Northwest-Kansas City location at the Northland Innovation Center and through Northwest Online. The University touts achievements that include a graduation rate in the 89th percentile of its national peer group. Northwest also owns state-leading career placement rates of 97.4 percent for undergraduates and 99.8 percent for graduate students. As part of the University’s retention strategy focused on affordability, Northwest includes textbooks and a laptop in its tuition, which saves students an estimated $7,300 over four years. Northwest also offers 1,200 student employment positions, allowing students to build professional skills through its internationally benchmarked student employment program.